Google has updated Gmail for Desktop, Android and iPhone and iPod touch. 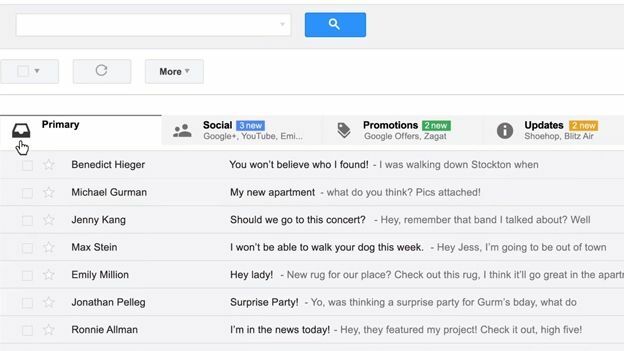 The new-look Gmail now offers a simpler tabbed interface which splits your emails up into five different categories. The new-look UI is much cleaner and has been designed to fight ever-increasing inboxes as we get more and more information via email. In an effort to remove the clutter from emails like iTunes receipts, marketing emails and so on Gmail will now split your emails into five different groups: Primary, Social, Promotions, Updates and Forums. Once in place it'll automatically sort your inbox into these categories letting you easily access emails that fit these themes, you can then drag and drop between the tabs as well and add or remove tabs you don't want. Gmail on mobile devices has also been given an overhaul based on the new tabbed sorting system. Whilst on the outside it may appear the same you can now access the sidebar and see your tabs listed, these are also colour coded. The inbox will also now show which section emails are sorted into with a small colour tab, you can of course then assign a contact to any particular tab you want. Both the Android and iOS apps will be getting the new update in the coming weeks however those who want to try it out now can change their desktop version to the new look now.